Welcome to the 5th Annual Frankfort Beer Week! Celebrate all that is great about Craft Beer in Michigan and do it in the cool, scenic, foodie town of Frankfort. Those who appreciate Craft Beer and delicious food know that the best things come from small-batch attention and creativity from people who care about the total experience. Celebrate beer. Celebrate life. Celebrate Frankfort. Start your day with beer-infused baked goods and stout brownies. Then get a head start on lunch with a bowl of stout beer soup. $1 off all Michigan beer on tap. Beer bagels made with beer from Stormcloud Brewing Company. Stout beer-battered whitefish sandwiches, a Frankfort Beer Week must-have. Purchases of $75 or more receive a free Stormy Kromer Wool Can Wrap. Mention Frankfort Beer Week and receive 10% off your retail purchase. Pour some beer knowledge into Frankfort Beer Week with The Bookstore’s line-up of beer books. Enjoy handcrafted beer from a Benzie County favorite: Lake Ann Brewing Company. On tap at Dinghy's Restaurant & Bar while it lasts. Beer lineup includes Doc Shilliday’s Cream Stout and Lake Ann Amber. $1 off first beer with purchase of a Frankfort Beer Week Pint Glass. Stormcloud's annual harvest season ales are brewed with hops grown and fresh harvested right here in northern Michigan. Frankfort Beer Week welcomes Ludington Bay Brewing Company to The Hotel Frankfort. On tap lineup includes: Big Nalu Imperial IPA, Summer Fling Heffeweizen, Pumpkin Cream Ale, Da Booty Imperial Stout, Tan Line Blonde Ale, and a MYSTERY BEER (have to visit to find out). $1 off first beer with purchase of a Frankfort Beer Week Pint Glass. Sink your teeth into Frankfort Beer Week with The Hotel Frankfort’s "Best Ever Beer Cheese Soup," Pumpkin Cream Ale Bacon Cheddar Dip, Sweet Stout Maple Ribs, Housemade Jalapeño Poppers, Beer-infused Pork Tacos, Beer Sauce Green Beans, and Stout Baked Beans. $1 off first beer with purchase of a Frankfort Beer Week Pint Glass. Grilled Beer Cheese Sandwich: a craft beer twist on a traditional favorite. Cheddar and American cheese combined with Bell’s Two Hearted IPA. Craft Cocktail: Atwater Bloody Mary. Detroit’s Atwater Brewery Foreign Extra Stout, vodka, and lime juice combined with the Mayfair’s delicious Bloody Mary mix. Enjoy 40% off all Michigan draft beers on tap. Get there early for Beer-glazed Doughnuts, while they last. 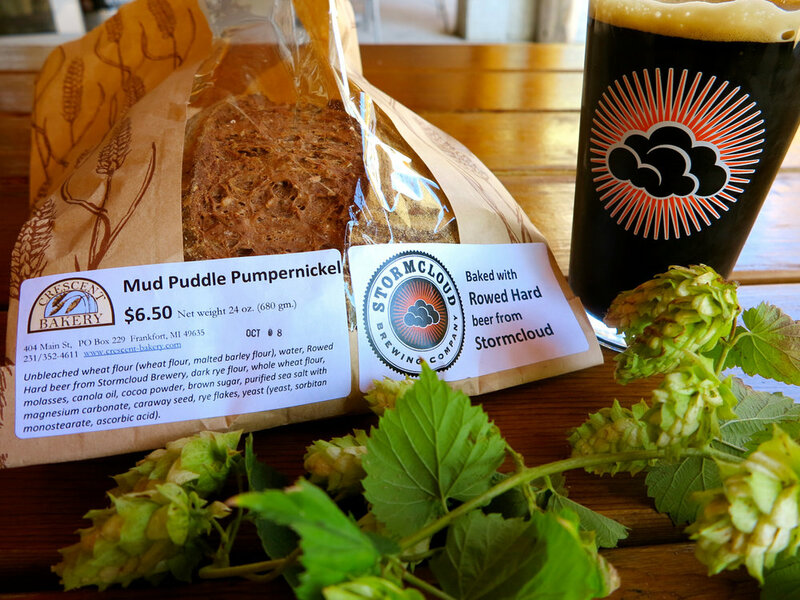 And take home a loaf of Altocumulus Onion Rye and Mud Puddle Pumpernickel handmade with beer from Stormcloud Brewing Company. Bring a date and enjoy two Michigan draft beers and two entrees from a select menu for $50. 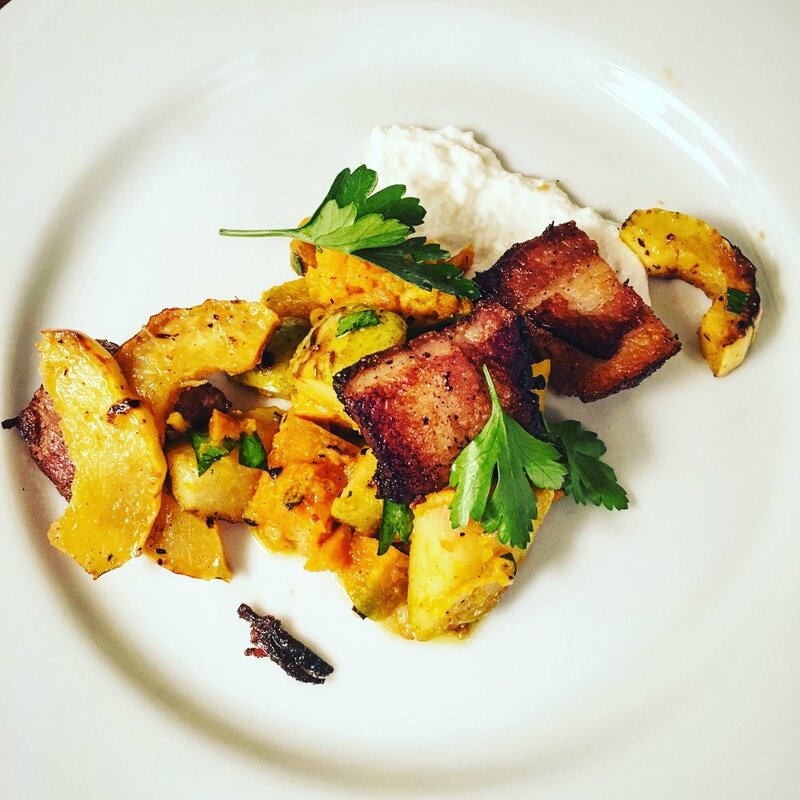 Enjoy a three course, prix fixe beer dinner for $25 per person. Optional beer pairings $15. $1 off first beer with purchase of a Frankfort Beer Week Pint Glass. BLT Flatbread with Atwater Vanilla Java Porter Aioli. Honor Family Market English Bangers with housemade Mashed Potatoes and Drunken Beans. Enjoy Happy Hour all evening on all Michigan beers on tap. Beer bacon biscuits served warm with local honey from Sleeping Bear Farms. Open to everyone: campers, Betsie Valley Trail riders and walkers, and general public. Enjoy a beer-infused featured menu item paired with a Michigan draft beer. Pass the mic to your young performers at The Cabbage Shed’s very first Kids Open Mic Night! And get a head start on your Halloween decorations with free pumpkins for carving during the event, along with free s’mores by the Shed’s outdoor fire pit (weather permitting). Email Beth at The Cabbage Shed to get your little ones signed up to perform. Adults can also get into the fall fun with a free pumpkin with a beer purchase. The Shed has 16 taps featuring 8 Michigan breweries, including mead and cider. $3 and $4 beer specials. Enjoy a live performance from local musician Bill Frary. Enjoy a live performance from local favorite Blake Elliott at Stormcloud’s downtown pub. Pull up a chair at this All-You-Can-Eat Pancake Breakfast, an annual benefit for the City of Frankfort Fire Department. Adults $8, Kids 8 and under free. Head to Frankfort’s Open Space Park on Betsie Bay to enjoy the annual Fall Festival. This year’s beer tent at the festival is pouring locally produced products from Stormcloud Brewing Company, St. Ambrose Cellars, and Iron Fish Distillery, in addition to domestic beer and wine. And don’t miss live music under the tent from the Scottville Clown Band (12-2pm) and Bill Frary (3-5pm). 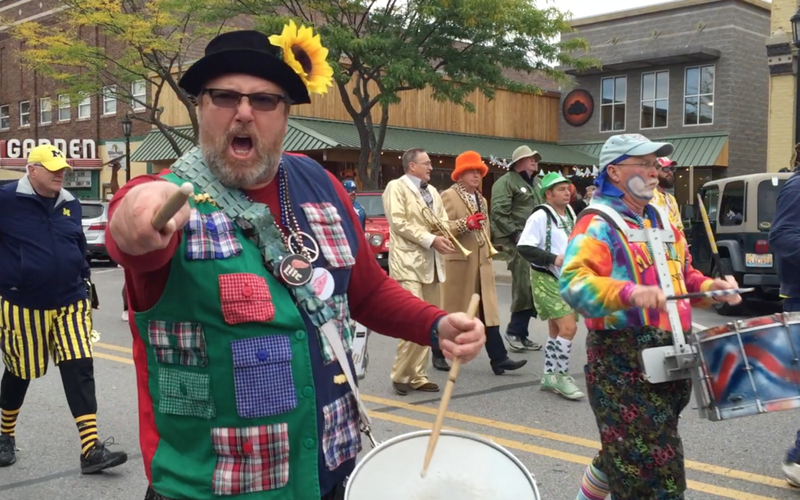 Enjoy a live performance from northern Michigan’s The Lofteez at Stormcloud’s downtown pub. Betsie River Campsite - Beer bacon biscuits breakfast special. Open to all (Fri-Sat). Birch & Maple - $1 off all Michigan beer on tap (breakfast & lunch only, Mon-Sat). Prix fixe beer dinner with optional beer pairings (dinner only, Wed-Sat). The Bookstore - Full line-up of beer books (Mon-Sat). Beer It Forward: % of purchase donated to Community Cats of Benzie County. The Cabbage Shed - $1 off one beer with purchase of Frankfort Beer Week Pint Glass (Thu-Sat). Kids Open Mic Night and Pumpkin Carving (Fri), Live music with Bill Frary (Fri). Beer It Forward: % of purchase donated to Benzie Area Historical Society. Coho - 40% off all Michigan draft beers (Mon), two MI draft beers and two entrees from select menu for $50 (Wed), Happy Hour on MI beers on tap (Thu), beer-infused menu item paired with MI draft beer (Fri, Sat). Crescent Bakery and Café - Beer-glazed doughnuts and beer bread (Wed-Sat). Crystal Lake Adventure Sports - Receive free Stormy Kromer Wool Can Wrap with purchase $75 or more (Mon-Sat). 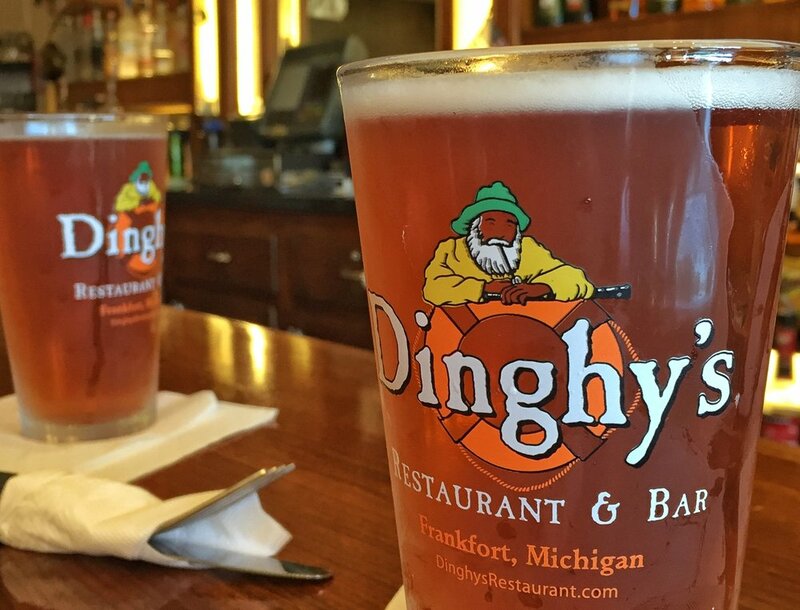 Dinghy's Restaurant & Bar - $1 off first beer with purchase of a Frankfort Beer Week Pint Glass (Mon-Sat). Lake Ann Brewing Company Tap Takeover (Mon-Sat). Beer It Forward: % of purchase donated to Friends of the Betsie Valley Trail. Frankfort–Elberta Area Chamber of Commerce - Beer Tent at Frankfort Fall Festival (Sat). The Garden Theater - Brewmaster Documentary (Tue). Harbor Lights Resort - Receive free Frankfort Beer Week Pint Glass with room reservation (Mon-Sat). The Hotel Frankfort - $1 off one beer with purchase of Frankfort Beer Week Pint Glass (Mon-Sat). Beer-infused food specials and Ludington Bay Brewing Co. Tap Takeover (Mon-Sat). Receive 10% lodging discount with Frankfort Beer Week Punch Card (Mon-Sat). Pancake Breakfast Fundraiser for Frankfort Fire Department (Sat). Beer It Forward: % of purchase donated to Frankfort Rotary Club. Hull's of Frankfort - Receive 10% off retail purchase with mention of Frankfort Beer Week (Mon-Sat). L'Chayim Delicatessen - Beer bagels made with Stormcloud beer (Mon-Sat). Manitou Restaurant - $1 off one beer with purchase of Frankfort Beer Week Pint Glass (Mon, Wed-Sat). Mayfair Tavern - $1 off one beer with purchase of Frankfort Beer Week Pint Glass (Mon-Tue, Thu-Sat). Grilled Beer Cheese Sandwich made with Bell’s Two Hearted IPA (Mon-Tue, Thu-Sat). Craft Cocktail made with Atwater Brewery Foreign Extra Stout (Mon-Tue, Thu-Sat). Oliver Art Center - ExhiBEERtion beer-themed, pop-up art exhibit with beer-inspired art from local artists (Mon-Sat). Petals & Perks - Beer-infused baked goods, stout brownies, and stout beer soup (Mon-Sat). Port City Smokehouse - Stout beer-battered whitefish sandwiches (Mon-Sat). Rocks Landing - Chefvitational Beer Dinner featuring Northern Michigan chefs (Mon). Stormcloud Brewing Company - $1 off one beer with purchase of Frankfort Beer Week Pint Glass (Mon-Sat), Harvest Ale Tapping (Mon), Storm Riders Beer Ride (Wed), Beer Trivia (Wed), Brews & Brushes (Thu), Beer & Cheese Workshop (Fri), Stormtoberfest and live music with The Lofteez (Sat). Beer It Forward: % of purchase donated to Friends of the Point Betsie Light. Wayfarer Lodgings - Receive 5% discount on cottage rentals with mention of Frankfort Beer Week. Pick up a Frankfort Beer Week Punch Card at the Frankfort–Elberta Area Chamber of Commerce and participating businesses. Get your card stamped at a minimum of five locations, then drop it off at Stormcloud Brewing Company for a chance to win prizes. Winners will be announced Monday, October 22. Participants do not need to be present to win. Harbor Lights Resort - Reserve a room and receive a free Frankfort Beer Week Pint Glass. Take your pint glass to participating restaurants for a discount on your first draft. Must be 21+ years old. 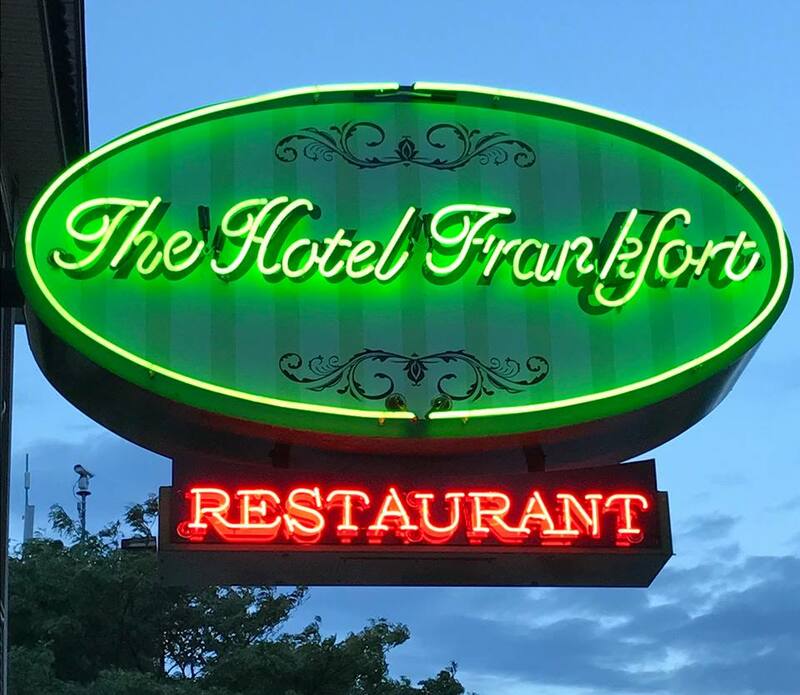 The Hotel Frankfort - Receive a 10% discount off lodging. Must present Frankfort Beer Week Punch Card. Wayfarer Lodgings - Mention Frankfort Beer Week and get a 5% discount on cottage rentals. Travel has to be completed by June 15, 2019. NEW FOR 2018: This year Frankfort Beer Week invites attendees to “Beer It Forward” with a charity fundraiser in partnership with the Grand Traverse Regional Community Foundation. Money raised during “Beer It Forward” promotions will be donated to endowments at the Grand Traverse Regional Community Foundation that are designated to benefit Benzie County non-profit organizations. Check with participating businesses to learn how you can Beer It Forward!